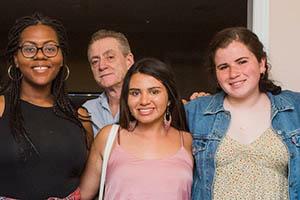 (L to R) Amaya Nicolle Gomez, Bill Gentile, Laura Romero and Maria Carrasco gathered at Gentile's home with other NAHJ members. "I didn’t find a lot of people like me, [who were] interested in the Hispanic community," sophomore Laura Romero said about her first days at American University (AU). "I am one of only two Hispanics in my graduate cohort," Ana Claudia Chacin told me during a recent interview. Ana Claudia is a first-year graduate student studying Investigative Journalism at the School of Communication. At the University of Miami, Ana Claudia majored in Latin America and International Studies. "Having left Miami, where everyone understands or is at least aware of what's going on in Venezuela, my home country, I missed being able to talk to someone that is familiar with what is going on there and in other Latin American countries." So, Laura Romero and Ana Claudia Chacin set out to find and connect with more students like themselves by helping found AU School of Communication's student chapter of the National Association of Hispanic Journalists (NAHJ) – the organization’s first student chapter in Washington, DC. Laura and Ana Claudia now are president and coordinator, respectively, of the AU chapter. As faculty advisor for the chapter, I have the pleasure to participate in what promises to be a vibrant component of AU’s student body – members of the Hispanic/Latino minority, the largest in the United States with origins in every corner of the hemisphere. According to the NAHJ mission statement, the organization "is dedicated to the recognition and professional advancement of Hispanics in the news industry." At the July NAHJ national convention in Miami, the NAHJ lived up to this mission. After a brief interview with a recruiter, Romero picked up an internship with Telemundo at NBC. "I learned production," she said during a recent interview. "I had never worked with producers." At the first, informal meeting of the chapter at my home here in Washington, DC, Chacin said she, "felt like [she] was back in Miami as people knew and understood what [she] was talking about, even if they aren't from the (South American) region. People who are involved in NAHJ are interested in these topics, which is really refreshing." Now, says Chacin, "I really love that I am a part of NAHJ because it serves as a home away from home. It's a big deal to have a home of sorts, and to be part of a group that understands the issues and cares a little bit more than a normal person." NAHJ members and event panelists at "Latinos and the Midterm Elections" event. Romero and Chacin were instrumental in organizing the first major NAHJ event at the School of Communication (SOC). 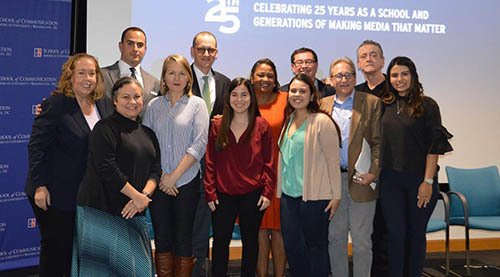 In a nearly packed Forman Theater on October 30, the chapter hosted a "Latinos and The Midterm Election" panel discussion with leading journalists representing CNN, Telemundo, Univision, NBC and NPR Latino. The panel was moderated by Eric Hershberg, director of AU’s Center for Latin America and Latino Studies (CLALS). SOC Dean Jeffrey Rutenbeck delivered remarks to open the event. The special guests stayed for nearly an hour afterward to chat with faculty and students. "A lot of people from other organizations really thought our panel was great," Romero said. She plans on reaching out to other universities in the area to grow the AU chapter. Chacin said, "I'm really excited to see how the chapter grows. Next semester we are hoping to collaborate with other organizations on campus to hold different events as well."